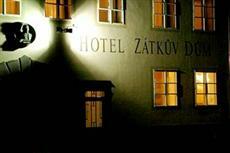 The Zatkuv Dum Hotel is located in the historic town of Ceske Budejovice, also known as Budweis. Hotels in the city center are surrounded by interesting medieval and baroque architectural sights, such as the murals and bronze gargoyles on the old town hall in the main square and the gothic church of the Presentation of the Virgin Mary in Piaristic Square. This Ceske Budejovice hotel is part of the historic fabric of the city, housed in two gothic buildings which are built into the city's walls. In fact, clues to this hotel's fascinating past have also been discovered recently when a medieval fresco representing the Baptism of Christ was found during a refurbishment. The Zatkuv Dum Hotel features a restaurant and a pizzeria, where guests are entitled to a 10% discount. There are also 2 compact meeting rooms, suitable for up to 16 and 18 people respectively, which are the ideal place to hold a business event or a special celebration.